During a Monday press conference, Gov. Bruce Rauner stood by his pro-business, union-weakening Turnaround Agenda as the deadline looms for legislators to pass a state budget next week. Rauner was joined by “leaders from Illinois business” that he said support elements of his plan like property tax relief, workers compensation reform and pension reform. 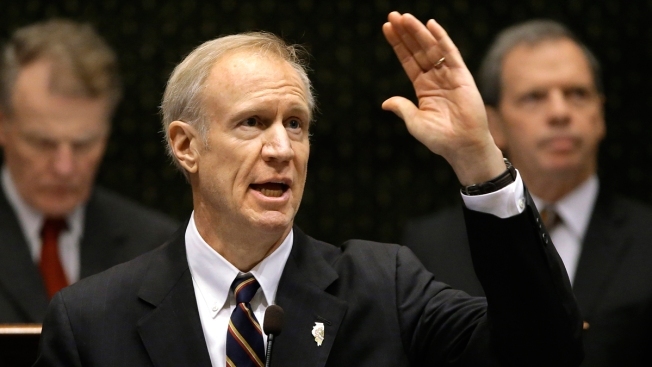 “They create more jobs, they result in higher family incomes and they’re necessary to have long-term balanced budgets in Illinois,” Rauner added. Rauner also noted that the state needs to become “more pro-job creator” because government spending is growing faster than family incomes resulting in unbalanced budgets. Illinois has been without a budget since July of last year. The impasse has adversely affected the state’s social services and public colleges and universities. The clock is ticking in Springfield as state lawmakers only have until the end of the month to pass a budget for this fiscal year. The deadline for the General Assembly to pass a budget with a simple majority is one week. During Monday’s press conference, Rauner said he was “cautiously optimistic” that bipartisan budget groups were making progress and encouraged members of the legislature to work towards a compromise. Rauner was also joined by Senate Minority Leader Christine Radogno and House Minority Leader Jim Durkin, who echoed the governor’s pro-business, pro-compromise sentiments.